'Clean Up Kennedy' is committed to ending the Illicit Massage Parlor blight on Kennedy Blvd by developing a community-based awareness campaign, supporting and equipping local law enforcement, and working with local government to end the victimization of women on our streets in Tampa. We had a great week this week, thanks so much to everyone who came out and supported Clean Up Kennedy! On Thursday we set up a booth at the 'Rock The Park' which is an event on the 1st Thursday of the month at Curtis Hixon Park. We talked to a lot of people who were very supportive of our cause. 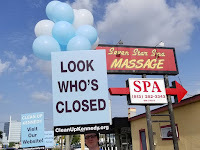 Many people still had no idea what was going on behind the blacked out windows of the many "massage" places on Kennedy. More and more people are telling us that they learned about the illicit massage business problem from recent local news broadcasts. 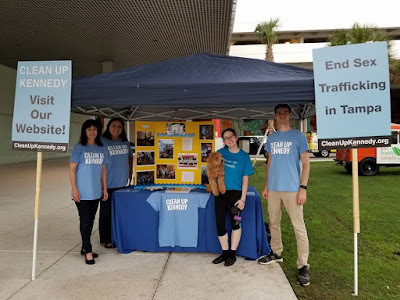 Being visible and continuing to keep this issue in the news cycle is important to change the culture of apathy and permissiveness towards the exploitation of women in the Tampa Bay area. 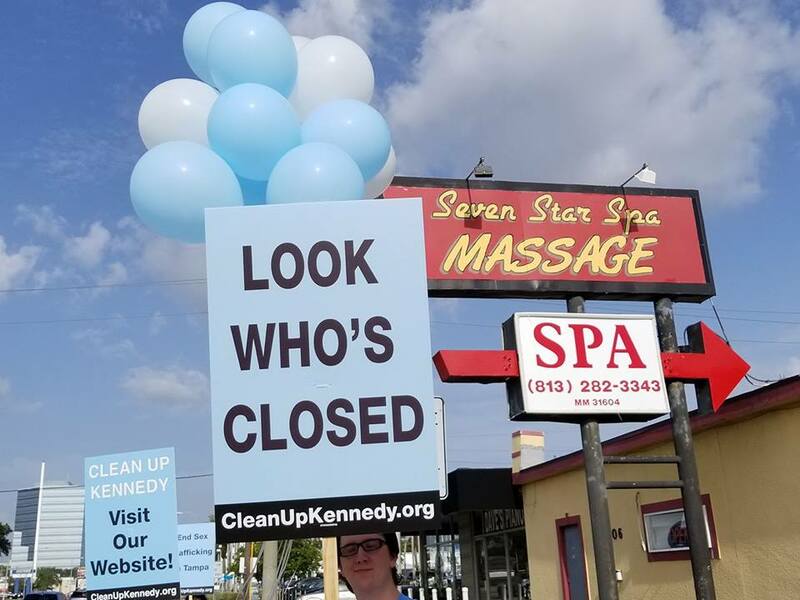 We went into Friday with an updated description of Seven Star Spa on Google Maps, the hours now display "Permanently Closed"
We had quite a number of citizens come to the demonstration to help celebrate the closer of one of the most prominent Illicit Massage Parlors on Kennedy. 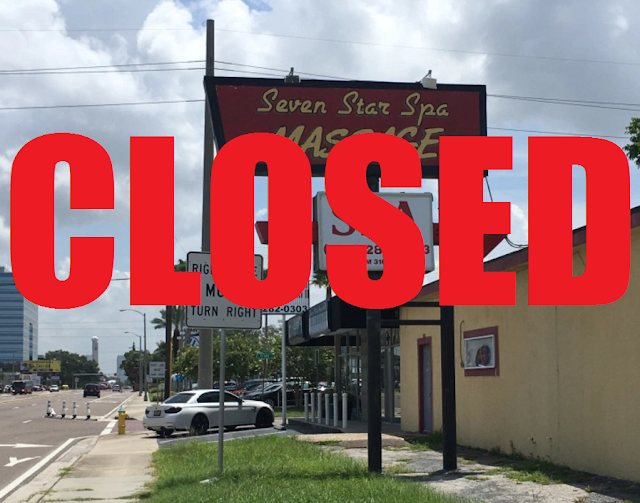 No one could drive past the former location of Seven Star Spa without learning that the establishment was no longer operating. Click Here to check out an immersive 360 shot of the event! Channel 8 and Fox 13 sent reporters out and aired stories about us over the next few days, unfortunately I was not able to find the videos online. As promised there was cookie cake. Facebook Live video from the event, featuring some comments from participants, a moment of silence for the individuals still trapped in trafficking situations and cutting of the cookie cake. This 27 page report, compiled from observation of the storefront, interviews with neighboring residents and businesses, public record analysis, and examination of its digital footprint, outlines many of the details of Crystal Spa at 3302 W Kennedy Blvd. Comparing these details with known warning signs for illicit massage businesses, the authors of the report have determined that there is a very high likelihood that Crystal Spa is operating as an illicit massage business. A look back at this property's history shows that this location has hosted several suspected illicit massage parlors over the past decade. Ordinance Passed! 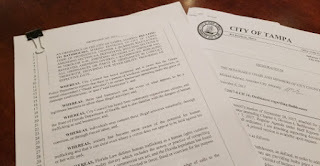 Clean Up Kennedy is excited to announce that the revamped “Bathhouse Ordinance” passed it’s second reading at the city council meeting on January 11, 2018. After plenty of deliberation and public debate the city council voted to officially adopt the Bathhouse Ordinance. 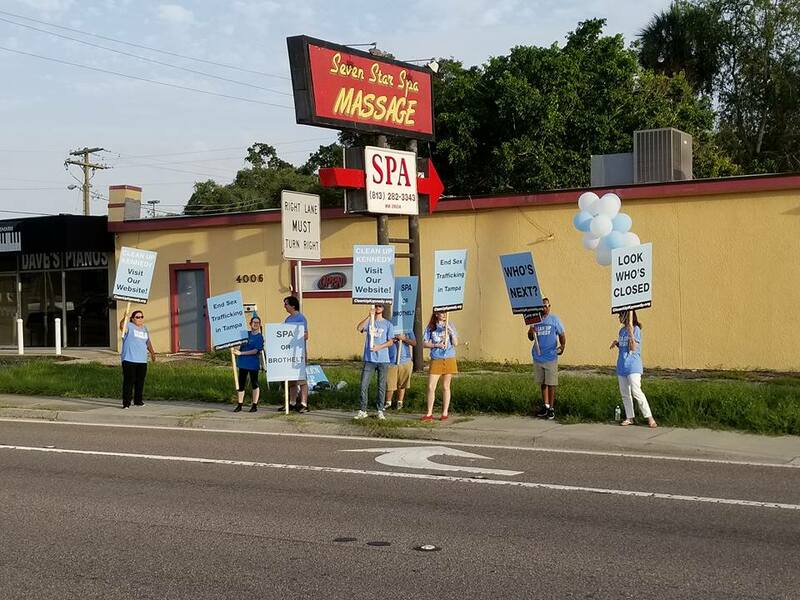 This ordinance will enforce codes that will make it more difficult for massage spas in Tampa to be dens for human trafficking. Among other things, the Bathhouse Ordinance enforces a 10pm closing time, requires spas to have a well lit front entrance, and requires spas to display information about human trafficking. These measures are steps in the right direction towards educating the public about the dangers of human trafficking that could be going on in their own neighborhoods. 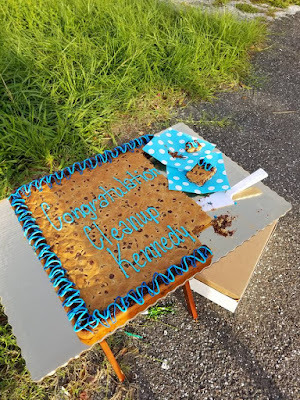 Clean Up Kennedy is proud to announce that after months of pressure from our street demonstrations and the coverage from the local news and calls from city officials, the property owner has asked the tenants to leave, and they have agreed. Seven Star Spa has closed. 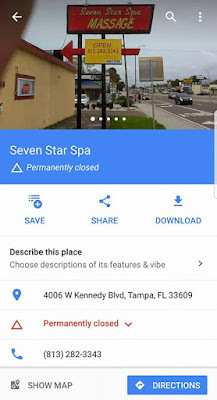 With its 20+ foot red and yellow sign Seven Star Spa has been one of the most visible illicit massage businesses for over a decade. We hope that other property owners will follow suit. If they suspect that illegal activity is occurring on their property they will quickly take action to see that it is put to a stop. These illegal and exploitative businesses that have been a fixture on Kennedy Blvd and across Tampa for decades are not invincible. 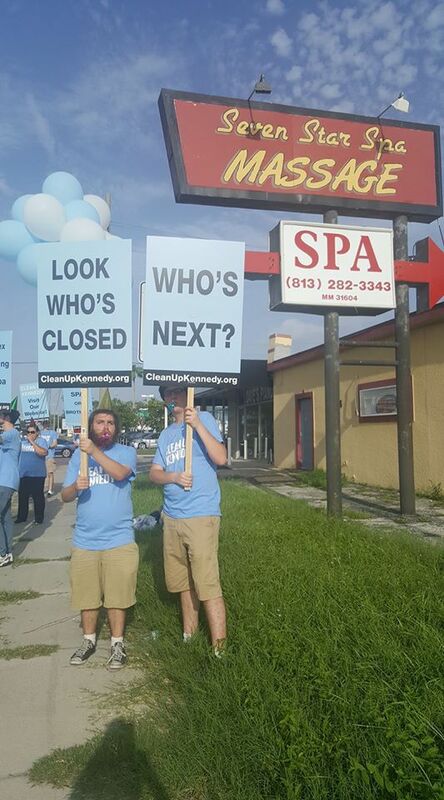 All it takes is for a few citizens of Tampa to stand up and say "No More!"